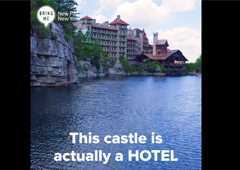 Mohonk Mountain House is a National Historic Landmark Resort nestled in the mountains of the Hudson Valley, only 90 miles north of New York City. Family owned and operated since 1869, our resort has welcomed guests for 149 years - many of whom have been coming to the resort with their families generation after generation. Like most historic resorts, our challenge is to continually inspire the next generation of travelers and create Mohonk's brand ambassadors of the future. Our target audience for this placement was Young Professionals and Millennials, in the Tri-State area of New York City. We hoped to target an audience with an affinity for outdoor adventure, a desire to escape the city, and a longing for unique experiences. Planning/Collaborating Buzzfeed's Bring Me team are masters of social content creation. We relied heavily on their expertise to produce a "highly shareable" segment that resonates with a younger audience and showcase our high end property. The video is comprised of a compilation of footage taken with a simple iPhone camera along with professional drone footage. This combination creates a sense of “point of view” approachability while featuring the beauty of the resort and natural surroundings. We collaborated with the Bring Me producers on curating the content. Shooting/Editing for Mobile All shots were selected and edited together with mobile viewing in mind. For instance, the messages over the footage are pithy, down-to-earth, and in a large font that is legible to read on a mobile phone. The entire video is only 1 minute long so mobile users won't get bored and will actually view the entire thing. This content is specifically designed for social sharing on mobile devices. The key messages of this piece are: - Mohonk Mountain House is a unique destination that everyone should experience. - Mohonk Mountain House is a hidden gem for young people who want to de-stress - Mohonk Mountain House is not far from NYC and a great place to get out into nature - For 149 years, Mohonk Mountain House has offered timeless activities and experiences – nature, fun, and time to reconnect with friends.